1 Peel onions and cut into very thin strips. 2 Trim, rinse and cut the cabbage into very fine strips. 3 Mix onions and cabbage in a bowl with some salt and let stand for 10 minutes. Squeeze lemon. 4 Mix together yogurt, quark, 2 tablespoons lemon juice and Worcestershire sauce. Season with salt and pepper. 5 Rinse apples, cut into quarters, remove seeds and cut into very thin slices. 6 Drain accumulated water from the cabbage and mix the cabbage with apples and yogurt dressing. 7 Pat dry pork medallions and season with salt and pepper. Crush fennel seed in a mortar and sprinkle on the meat. 8 Chop walnuts coarsely and fry in a non-stick skillet. Remove, wipe out pan and heat oil in it. 9 Add pork medallions. Depending on thickness, fry on each side for 3-5 minutes. 10 Take medallions from the pan, wrap in aluminum foil and let rest for 5 minutes. 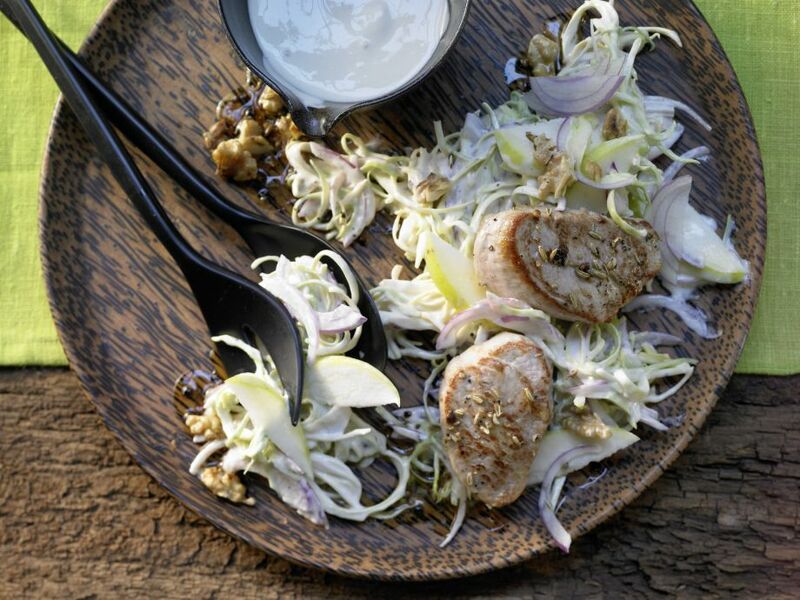 Serve with the salad and garnish with walnuts.